Hurricane victims from Iceland that have been stranded in New York will be getting some rockstar service on their way back home. 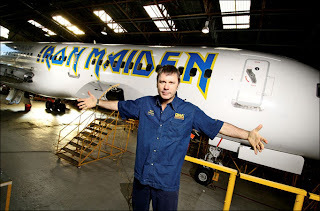 Iron Maiden singer Bruce Dickinson will be flying the plane that the band used for touring from New Jersey to Iceland as soon as air travel is permitted to get some stranded people home. The band's plane, painted and everything, is leased out regularly by Icelandic Express for flights when the band is not touring. Dickinson is not the regular pilot, but when good press allows he gets in the captains chair. He is like the Bono of the air.